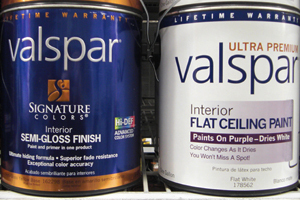 Paint has none or very low level of gloss and a matte surface. Flat finish looks dull when dried. It doesn’t reflect sun light, but hides some small surface imperfections or blemishing in application like a brush marks. With this type of paint finish it is not necessary to repaint the whole room to fix one problem because it can be touched up locally. The main disadvantage of flat finish paint is that its porous surface absorbs all household stains. Therefore, it is not recommended to use it on high traffic areas, such as kitchen or bathroom walls. This paint finish can be suitable for ceilings and theater rooms. Paint has a tiny amount of sheen and when dried the surface looks a lot like the shell of an egg. Since this finish has more gloss level than flat finish, it can hold up better with cleaning. It is low maintenance paint finish and less porous with better stain resistance comparing to flat sheen. Normally eggshell can be used for kitchen, bathroom, and laundry rooms. It doesn’t hide imperfections as flat finish, but it reflects more light. It is velvety type of finish with some gloss. It also holds up to cleaning because of its washable surface and reflects some sun light. Therefore, it is a good idea to use it for children’s room, kitchens, bathrooms, or in areas of the house with high traffic. Paint has medium gloss level and is more durable compare to other finishes. In addition, it is washable and therefore it is easy to clean. However, it looks sort of poor and cheap on walls. It doesn’t hide imperfection. Therefore, it is better to prepare areas very good where the paint finish is going to be applied before painting the surface. Otherwise, all bumps, dents, cracks, or other imperfections will not be hidden entirely. It is mainly in use for painting interior wood surfaces such cabinets, doors, windows or trims. Paint with a highest gloss level. Appearance of this paint finish is very shiny and can look cold and uninviting. As semi-gloss, it is also good to apply mainly for windows and doors or on thoroughly prepared and smoothed surfaces. High-gloss paint is good for kitchen and bathroom walls because of its resistance to water and grease. Particular paint finish will work the best in certain application. Painting one house or even separate room using paint in one finish is not a best option but its combination will bring optimal visual appearance, design and practical usability. As an example, instead of using flat or gloss paint only it is better make separation and use flat on ceiling, gloss on trims doors and windows and eggshell on walls.